The folks at Global Caster Corporation are excited to service all your needs for casters and wheels, regardless of order size or specifications. Our entire catalog consists of over 40,000 combinations of casters and wheels. Choose from the Global Caster line or from over 200 brands. 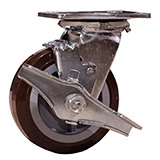 With one of the largest network of caster and wheel warehouses in the United States, we are able to match the proper caster to your needs and serve you promptly. Global Caster Corporation specializes in the OEM and after market replacements and caters to the furniture, fixture and industrial markets for J.I.T. (just in time) programs. We love to help with those impossible hard to find specialty casters and wheels. It's our delight to have the challenge from you!! !